Star Wars enthusiasts will love this miniature prototype of R2D2. The 3D model is astonishingly detailed. The Star Wars R2-D2 Metal Construction Kit includes instructions and two sheets of cut steel parts. He will be able to create a beautiful 3D model from flat steel sheets. The pieces pull out and fit into slots. No glue is required. The detail on R2D2 is complex. R2D2’s dome-top has raised areas and lenses. The recessed ports and vents are evident in great detail. These new Star Wars models are much more challenging than the early Star Wars models. There is a remarkable increase in the sophistication of the kit and this makes the model more enjoyable to build. This model is too challenging for a child to build, but just right for an adult. The manufacturer flattens each piece into 3 inch by 3 inch metal sheet. The user breaks the pieces off the metal foundation and uses small tabs to fit into slots on other pieces. The tabs are bent over gently to bind the parts together. The final product, with its amazing detail is impressive. The model has depth to it with transparent tiers that you can see into. 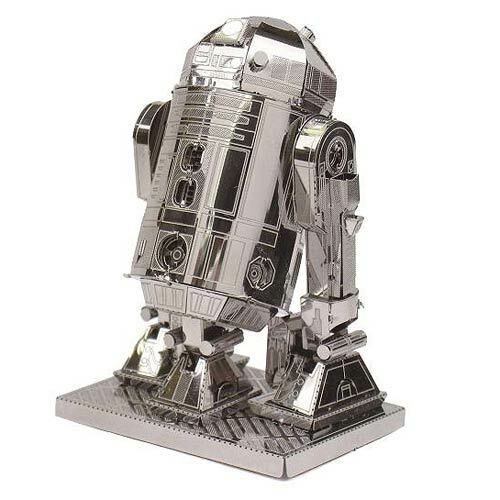 When finished, this is a display quality piece, and R2D2 looks fabulous in metal. 5 x 5 x 8cm assembled.